Dinners with pork as the main course. Do you have old family friends that feel more like family than many of your own blood relatives? I have such fond memories of my second “family” that date back to when I was only about 5 years old. My “Aunt” and “Uncle” and all their kids generously invited my entire family over for pool parties that included lots of fabulous food (even lobster! ), plenty of champagne and an unlimited supply of stories and laughter. Through the years we have remained connected by our love of food and fun. Today, as our parents are aging, the “kids” have taken over hosting the parties and now our kids play together. We may not share a last name, but what we do share is a lifetime of love, laughter and great memories. In my book, champagne is thicker than blood. 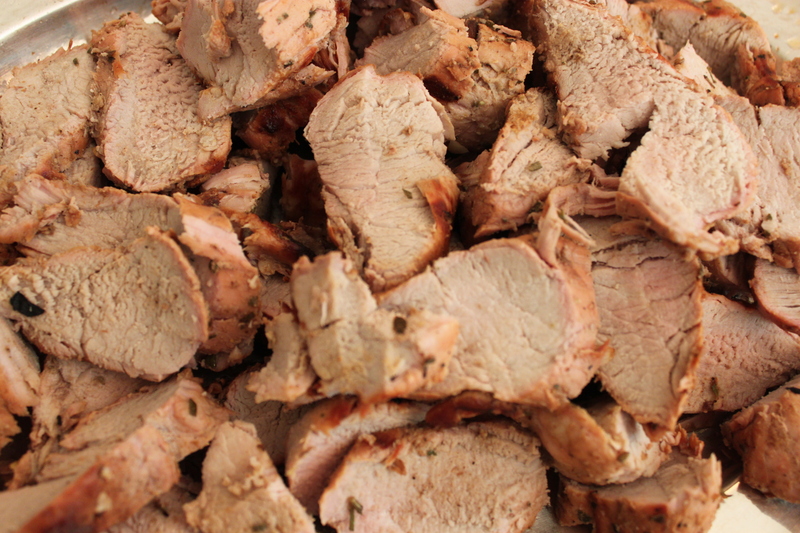 Marinate Pork: ½ cup olive oil, 4 cloves of garlic, ¼ cup of white wine, ¼ cup of chicken broth, 2 TBS of fresh chopped rosemary, 1 TBS of Thyme, Zest and Juice of 1 Lemon, Salt/Pepper. Marinate in Ziploc for 10 mins. or 10 hours. Cook pork on (sprayed) tin foil for about 10-15 minutes on High. Flip and cook for 10-15 mins. on Medium (or turn off middle burner). You can buy basil (or sun-dried tomato) pesto in a jar or tube which is MUCH easier but I try to make a big batch and freeze it. In food processor, combine ¼ cup of pine nuts, 2 cups of packed (dry) basil leaves, 1 TSP of salt, ½ TSP of pepper and 1 clove of garlic. Pulse until chopped. Keep processor on and gradually add about ½ cup of EVOO (add more as needed) until smooth and creamy. Pour into a bowl and stir in ¼ cup of parmesan cheese and zest/juice of ½ lemon. You can also use it as a dip for the pork. Cook 1 pound of pasta and reserve some pasta water. Drain pasta. 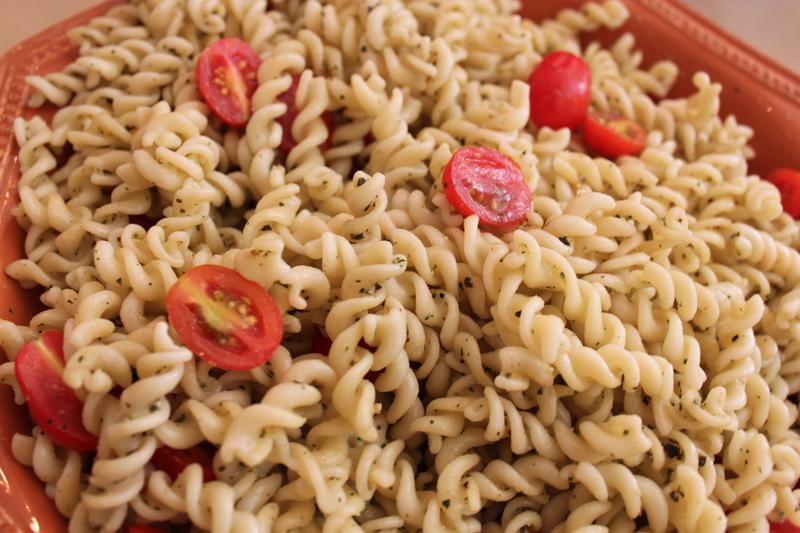 Mix 1-2 TBS of pesto into a small bowl and mix with ¼ cup of pasta water. Stir into pasta. Repeat again if necessary adding more pesto/pasta water as needed. Pesto is strong so you don’t need too much. Add a container of grape tomatoes cut in half. This adds color and sweetness. Cut up Peppers (yellow, red, orange), peel and cut celery, slice grape tomatoes and baby carrots. Finely chop ¼ of onion and add to veggies. Drizzle about 2 TBS of EV olive oil, ¼ cup of red wine vinegar and ¼ cup of rice wine vinegar. Mix with salt, pepper, and some chopped fresh basil leaves. You can make this several hours ahead of time. Cut up cantaloupe, honeydew, strawberries and pineapple – add blueberries if you have them! Help measure and mix the pork marinade and pour into the Ziploc bags. Teach kids to smash the garlic to open it and then peel (use a wooden spoon or cake knife). Mia saw the garlic had brown spots and said “look mom, the garlic has acne!”. Help using the food processor to make the pesto (ask them to add the oil or press the button to food processor). 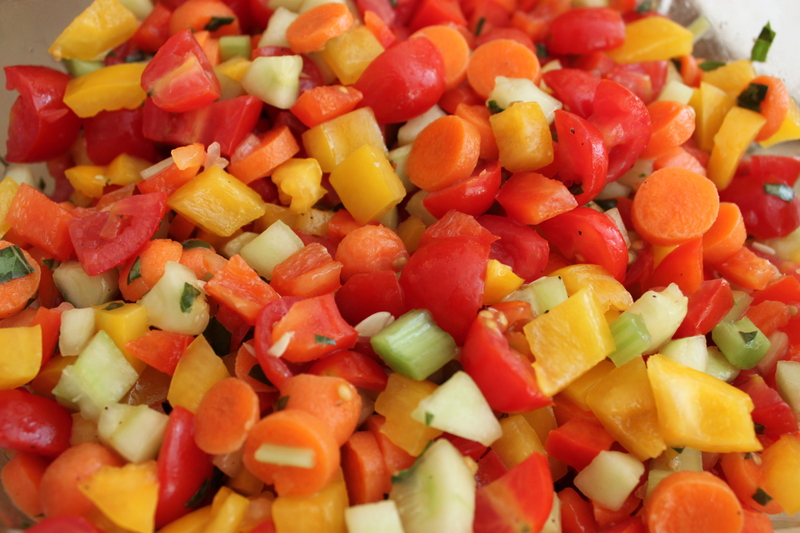 Help count the colors in the veggie salad – ask them to be a taste tester too! The name “pesto” derives from the preparation of the sauce with a pestel and mortar. When did the movies get so nasty? I think it was when they started selling pizza and hot dogs – what’s next Chinese Food? Must we serve the exact same food everywhere? I heard that some Chinese restaurants are actually serving chicken nuggets now. Even the new movie theaters smell like stinky feet and god knows what else. It’s like getting on a packed airplane for a 3+ hour flight and the person next to you in the center seat pulls out a bag of McDonalds. Does a nose clip come with that barf bag? I see these 300 pound men and women at the movies ordering enough food for the Octomom and Gosslin Families combined and I want to yell “Stop – do you know that will kill you!”. Pretty soon they are going to install moving walkways up the aisle because nobody will be able to walk the steps. Now can you please tell me one final thing? As completely offended and utterly disgusted by all this behavior at the movies, why is it that even I cannot resist the free pass – to eat an entire bag of Sour Patch Kids in the dark. You know what they say, what happens in the movies, stays in the movies. 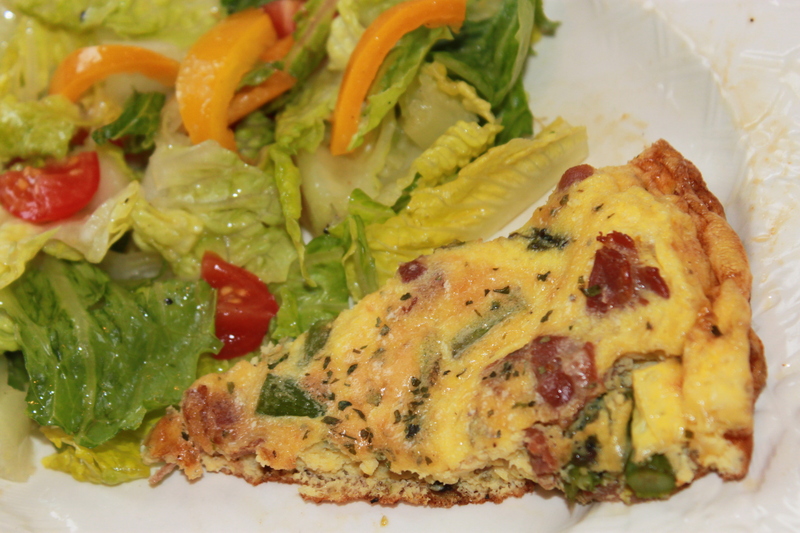 Frittata: You can make this frittata with any ingredients (ham, sausage, peppers, mushrooms, spinach, shredded cheese, herbs) and serve it for breakfast, lunch or dinner! Heat TBS butter (or EVOO) in a hot skillet and cook your ingredients (prosciutto/asparagus) until cooked through. Add a drop of EVOO to ingredients to prevent eggs from sticking if needed. Pour eggs over ingredients. Cover and let cook for 5 minutes (eggs will still be wet, careful not to burn bottom of pan). Put skillet in the oven on BROIL for about 5 minutes until knife comes out clean. Serve it like pie. Note: You can also simply bake the frittata on 350 for 20 mins. after you pour the eggs into the pan. White Bean/Artichoke Soup: I made this up from ingredients in my cabinets (served 4). The color wasn’t the prettiest but it tasted so delicious! Sautee 1/2 onion in a soup pot with a little EV olive oil until soft. Add 3 cups of chicken broth, 1 can of drained cannellini beans, 1 can of chopped artichoke hearts, and 1/2 teaspoon of chopped rosemary. Boil and then simmer for 30 mins. Use hand (immersion) blender in the pot to blend and thicken soup. Add good hit of salt/pepper and sprinkle with parmesan cheese. Serve with bread for dunking! The kids didn’t like it until I gave them the bread to dunk. Salad:Clean and dry romaine thoroughly so it won’t get soggy. 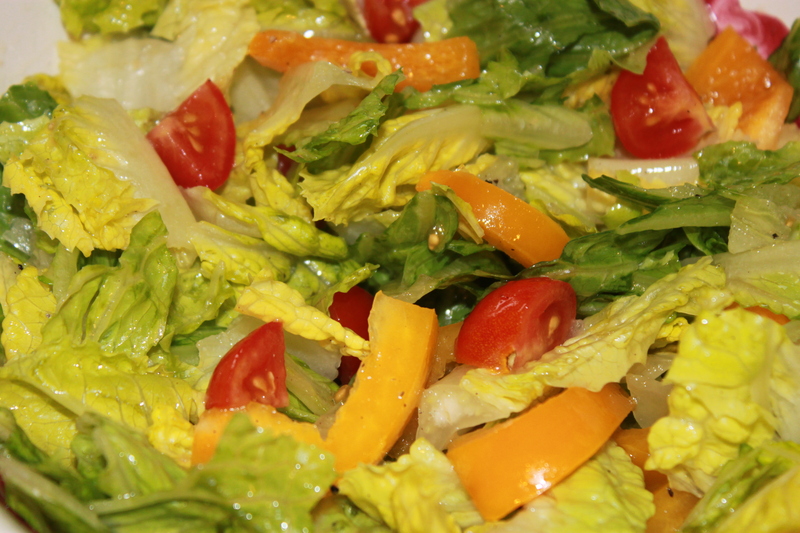 Add toppings (yellow pepper and tomatoes) and toss with salad dressing. Teach kids how to crack eggs (do each one in a separate dish so you can fish out shells if needed). Measure and add 1/2 cup of cheese to the eggs. Wash asparagus and help pull apart prosciutto into pieces. Teach kids how to know where to cut bottom of asparagus – take a piece in your hands and snap the bottom off gently. Wherever it breaks is where you should cut the rest. Teach kids how to measure butter (2 TBS) and add to pan. Dinner Game: Pick a letter (or start with A) and see how many foods you can name that begin with that letter. It’s a good way to teach new foods. A Spanish Tortilla is like an Italian Frittata but is usually made with potatoes (no cheese) inside and served with a garlicky mayonnaise. A French Omelet hold a small amount of filling and is rolled-up several times. 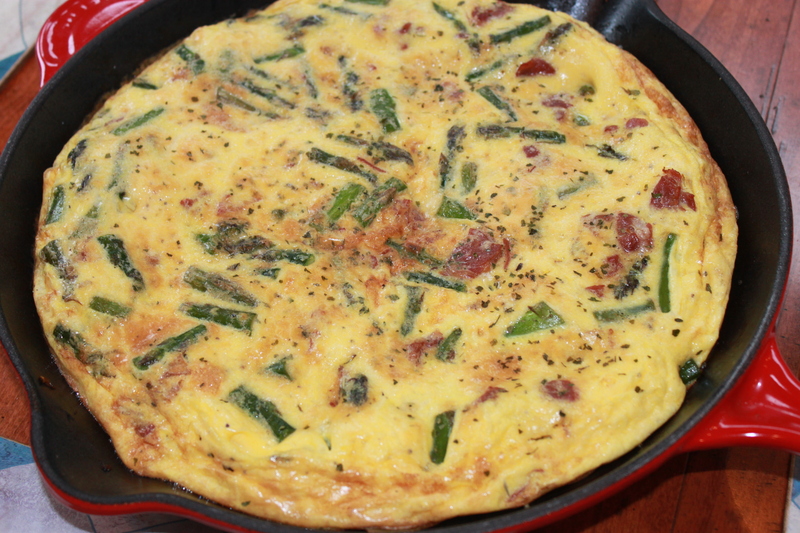 Frittata means “fried” (although some people bake them – like my husband). Koreans are evaluated in 1st and 2nd grade to determine their strengths and appropriate career path. If they show no musical talent at that age, they will not be given the opportunity to explore music. They also go to school from 8AM to 10PM at this very early age. It’s no surprise that they are not only over-achievers but are also under-emotional. My question is….how do they really know if a child is good at something at such an early age? It seems a shame and a complete waste of potential talent. I feel the same way when I hear a parent tell me “my child only eats 4 things”. Are the 4 things at least healthy things? If not, can you blame them? I once knew a mother whose son ate absolutely nothing for lunch at school every day. Upset he would starve, she stopped at McDonalds after school. Think he ever learned to eat at school? Why would he? We may not be able to make the kids like all foods (at least not right away) but we can control the choices we give them. We can also continue to expose them to a variety of foods. How do you know that your child won’t develop a taste for broccoli if they tried it once when they were 5 (didn’t like it) and never tried it again? Let’s hope you don’t feel the same way about the piano. 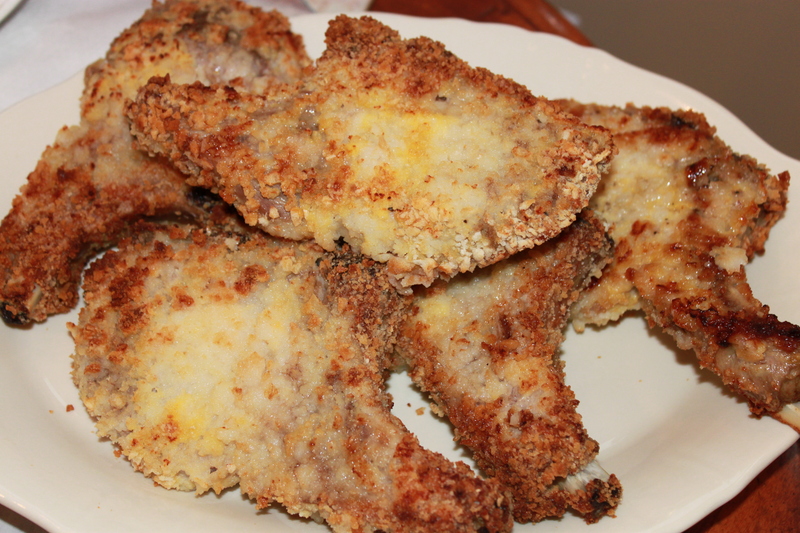 Dip pork chops in egg and then in bread crumbs (Panko or Italian). Place on parchment paper or lay chops on a cookie rack over your baking sheet. Spray pork chops with a little oil. Bake on 425 for approximately 30 minutes. Peel 3 large (or 4 small) sweet potatoes and boil until cooked through. (I like to use a hand blender). 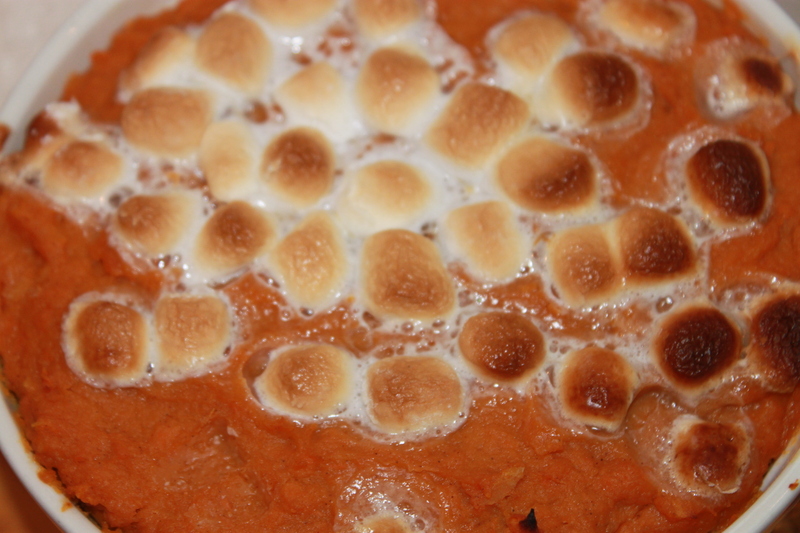 Put in a serving dish and top with a couple marshmallows. Bake with pork chops for approx. 30 minutes (make sure not to burn marshmallows). 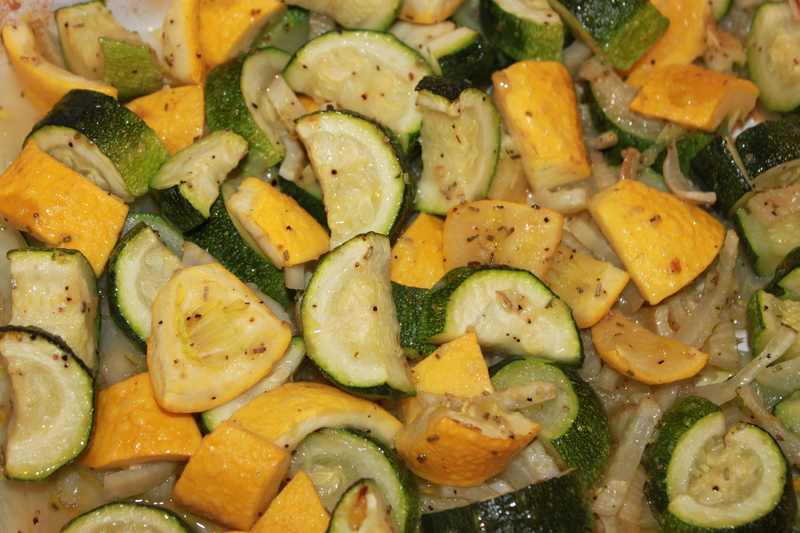 Cut zucchini (I added fennel too) and toss in a baking dish with a little olive oil, salt/pepper and rosemary. I grated some garlic into it too. 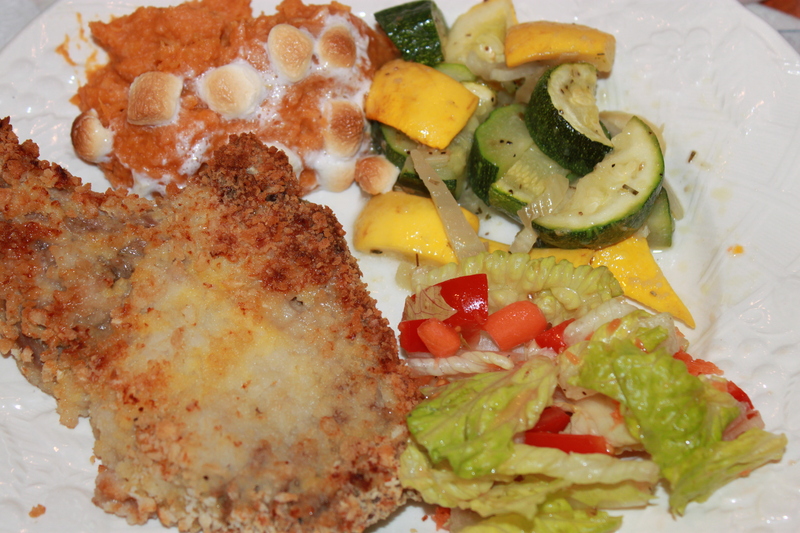 Toss with ½ cup of parmesan cheese and bake with pork chops for approx. 30 minutes. – when else can they get their hands so dirty! Help measure 3 TBS of ingredients for the potatoes and blend. Let them add marshmallows (maybe make a design). Add cheese, salt/pepper to veggies and stir around. Try Zucchini bread – it tastes a lot like pumpkin bread! If you are not italian and you go from complete euphoria to screaming mad in the blink of an eye, they call you “bi-polar” but in my family, we just call you “Sicilian”. Not sure what I mean? Let me explain; any of the women in my family (thanks to our Sicilian genes) can be incredibly sweet, kind, giving and quite thoughtful. However, quicker than the speed of light we can change on you, for what seems like no reason at all. It usually happens when somebody else does something stupid or we have witnessed some sort of injustice or maybe we are just tired and cranky. You wouldn’t think it if you saw us, but it’s true (at least from my dad’s side). Take my Great Aunt Ida (pronounced “ee-da”), she once went into Termini’s Italian Bakery in South Philly to complain about a cake that was stale. After a debate with the owner she was basically told, “oh well”. If you have ever been to Termini’s you know that cakes, cookies and pies are lined up and down the aisle of the store. Aunt Ida proceeded to leave the store yelling in Italian and knocking EVERY SINGLE BAKED GOOD off the tables on her way out – Bada Bing Bada Boom! So be kind to those you meet, you never know – they could just be Sicilian. 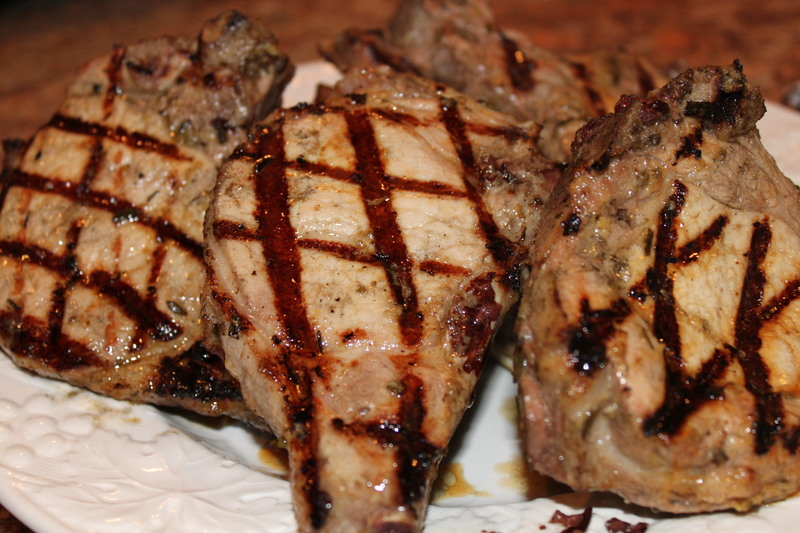 Grilled Pork Chops: I use a similar marinade (based on Ina Garten) whether I’m roasting pork tenderloin or grilling chops. I use all the same ingredients for almost all my recipes. None of the flavors are too overpowering which is important when cooking “the family meal”. 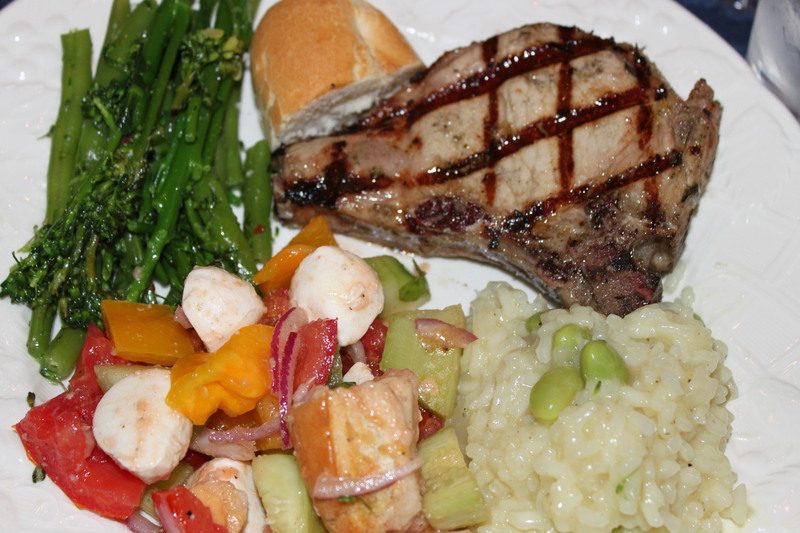 Put all the ingredients in a large Ziploc bag and marinate the pork chops in for 10 minutes or 10 hours! Add Pork Chops and marinate (if longer than 15 mins. put back into fridge). Grill Tips: Get the grill super hot to start (the meat won’t stick that way). Put your meat on the grill at HIGH for a minute or two. Turn the middle burner off or just turn all burners to MEDIUM. Flip only ONE TIME. Lower heat to Low/Medium until cooked through. Remember if you can put pork chops on a plate and cover with tin foil, they will continue to cook. Risotto w/Edamame: This takes about 1/2 hour to make and you have to stay with the pot. It’s worth the time but make sure you have it for this recipe. Instead of edamame try peas or asparagus (whatever you have)! I found this recipe a few years ago in Real Simple Magazine. Cook 1/2 chopped onion in a little olive oil for 5 minutes until soft. Add 2 cups of Arborio rice and stir. Add 1 cup of white wine (I like to use Sauvignon Blanc) and stir/cook until liquid is absorbed. Add 4 1/2 cups of chicken broth (adding less than 1 cup at a time – waiting until broth is absorbed before adding next cup). Add a little lemon (zest or juice) and 1/2 cup of Parmesan cheese. Add edamame (buy it shelled for ease) and salt/pepper. Sprinkle with cheese to serve. Broccolini: Broccolini is similar to broccoli rabe but not nearly as bitter. Wash and cut ends off broccolini. Boil about 2 cups of water w/ a dash of salt. Cook broccolini for about 5 mins. until tender but still firm. Drain. Return to pot and add some fresh garlic, a drop of EV olive oil, salt/pepper (and a few red pepper flakes) and sauté for a few minutes. Add the broth to the risotto and stir. 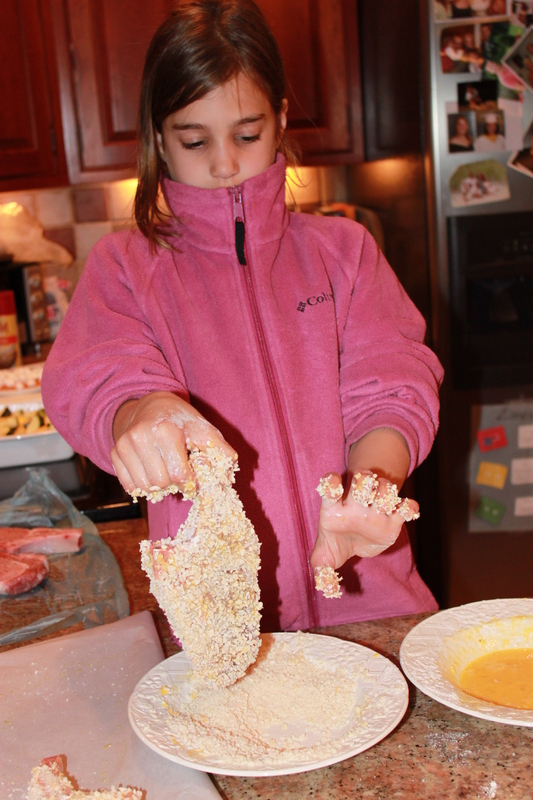 Mia told me when the broth when was absorbed and it was time to add more. Dinner Game: Ask all but one to close their eyes. One person takes a dish away or eats something off their plate and everyone has to guess “What’s Missing?”. Salad: Mix in whatever you have! Mix tomato, red onion, celery, cucumber and yellow pepper. I had some leftover mozzarella cheese too! Toss with fresh basil, salt/pepper, olive oil and red wine vinegar. The Arabs brought rice to Sicily and Spain. Arborio rice is used because is has the ability to absorb liquids without over-cooking. Broccolini is often called baby broccoli but it is actually a mixture of regular broccoli and chinese kale. 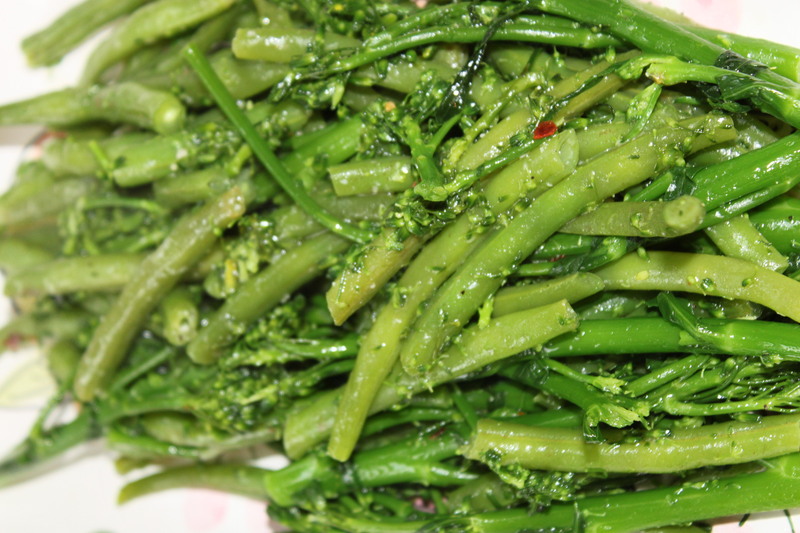 Broccoli Rabe is different from Broccolini. Broccoli Rabe can be bitter but broccolini is very sweet. How many cookbooks do you have? How about tiny recipe cut-outs floating all over? If we add them all up, we probably own thousands of recipes and yet why do we resort to the same 5 dinners over and over? What would be really great is if we all had our 15-20 “tried and true” basic recipes that cover the gamut of vegetables, meats, and starches. Imagine going an entire month without repeating the same dinner while exposing your kids to a variety of basic foods?! Imagine going out for dinner and you all eat and share from the regular menu?! Yeah baby, now I’m talkin’…..
HAM STEAK: Ham steak with boiled carrots and sweet potatoes was one of the first dinners I gave Mac and Mia at 10 months old. It’s an oldie but goody and certainly speedy! Try to get a good ham steak from the butcher or Fresh Market if you can. It’s already cooked so all you need to do is heat it up. Simply lay it on a foil lined baking sheet, sprinkle a tiny bit of brown sugar on it and pop it in the oven for 10-15 minutes. You can also heat it up in a frying pan with a little maple syrup and butter. 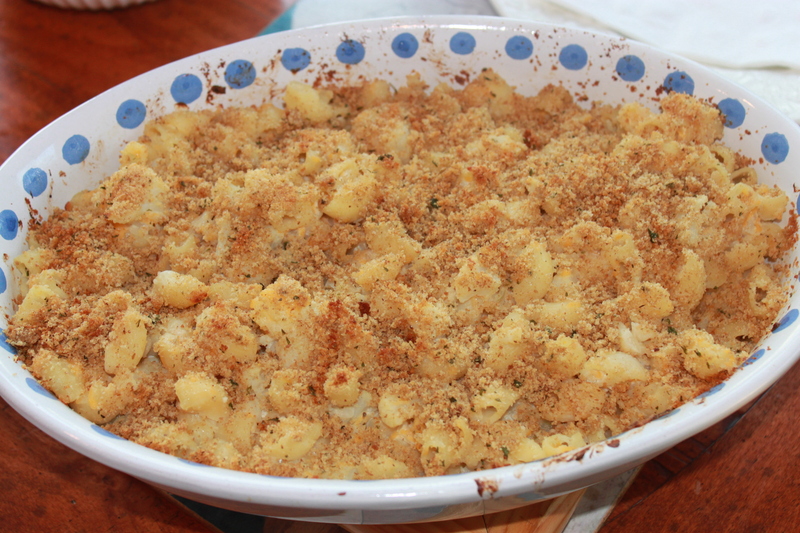 CAULIFLOWER MAC N’ CHEESE: This is so good and if you over-cook the cauliflower a little bit, it has the same consistency as the pasta so it goes literally unnoticed. Cut cauliflower into small pieces and boil for 10 mins. or so. Drain cauliflower out and boil pasta in same pot of salted water. Drain pasta. Bake for 10-15 minutes (with Ham steak) on 400. This makes a huge portion. 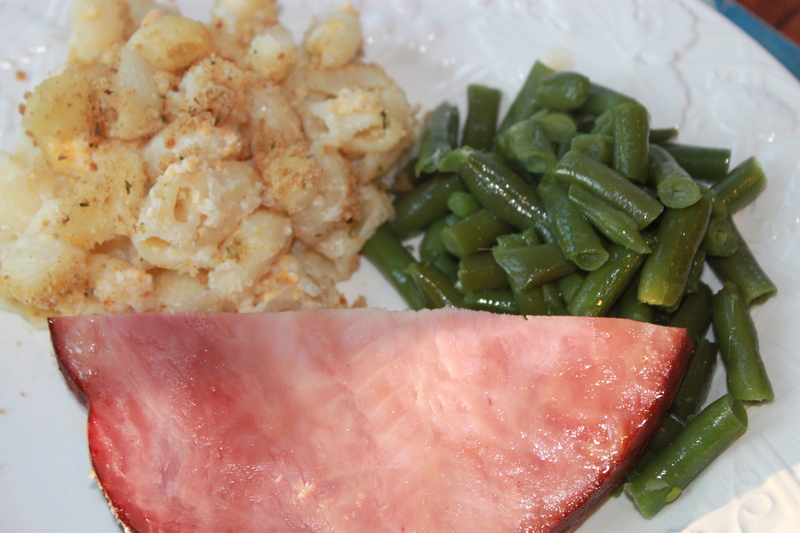 Not bad to serve larger family group at Easter with spiral ham. Keep a bag of frozen string beans, corn and peas from Fresh Market on hand at all times for a quick veggie side. It tastes like they grow and freeze them in the back of the store! Mia loves to point out which piece of cauliflower to cut next. Which one is biggest? “That one!”, she points. Watch Sisters Cheer Happy St. Patrick’s Day! St. Patrick was actually italian?! Born in Scotland, St. Patrick’s parents were both Romans so technically, yes it’s true, he was italian. Green Eggs and Ham was published in 1960 and as of 2001 it was the 4th best-selling children’s book of all time. The correct way to pronounce this dish is with a very italian, Sopranos kind of voice….”I’m havin’ a Pork Sang wit Brahkly Rob and a side of To-may-tah and Motz”. It tastes better if you say it like that. Anyway, I had a school meeting tonight so this was my version of a quick dinner. Go to the italian deli and get a pound (or 2) of roast pork, 1/4 pound of provolone, side of pork gravy, broccoli rabe and a nice italian roll. It comes with a side of garlic breath but it’s worth it. PORK SANDWICH: Layer the pork in a baking dish and pour the gravy on top. 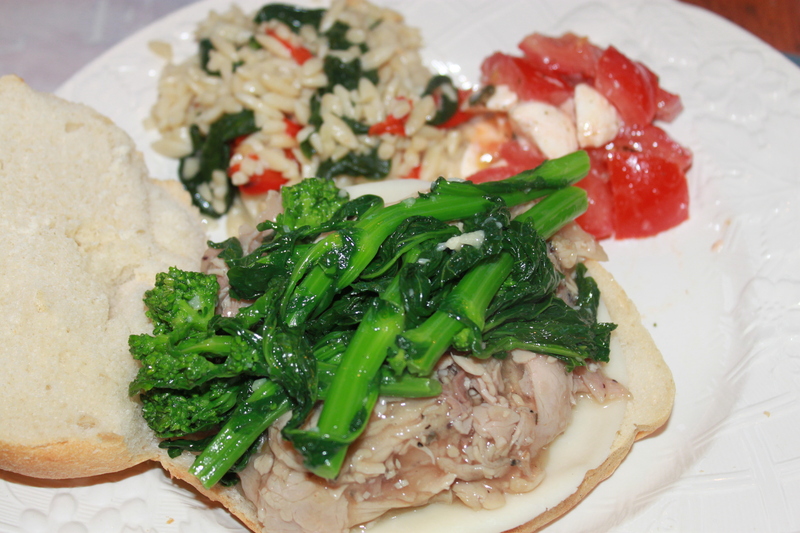 Heat through (on 350) and serve on the roll with a slice of provolone and some heated broccoli rabe on top. TOMATO AND MOZZ: I use vine tomatoes and take the flesh/seeds out and slice. Toss with the Mozzarella, salt/pepper a drop of olive oil and basil. Note: I didn’t have fresh basil so I used some leftover pesto I keep in the freezer, however you can buy pesto in a jar and leave it in the fridge to add flavor anytime. 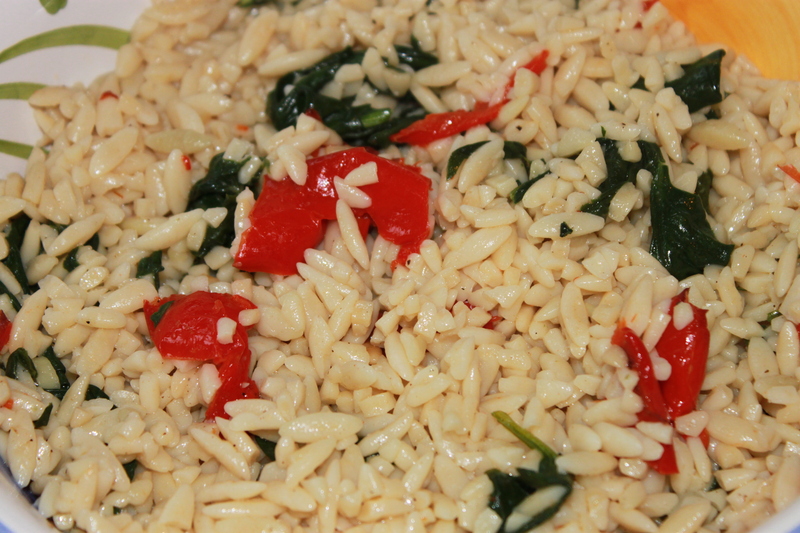 ORZO: I always like to have some kind of starch so I boiled a cup of Orzo and tossed some spinach leaves and a couple of roasted peppers in there for color. Add a drop of EV olive oil, salt/pepper and grated cheese (may need to add a little pasta water back in if it looks too thick) and Presto. Note: You can add some onion or garlic powder for flavor too. I served this room temperature and let it sit in the pot with the rest of dinner so I could get ready to go out. Layer pork on baking dish and pour gravy on top. Toss spinach and peppers into orzo and help add seasonings. The Roast Pork sandwich is slowly taking over the spot as #1 sandwich in Philly leaving the cheese steak, dare I say it, 2nd place? Some people from Maryland have been known to drive 100 miles for this $7 sandwich. Philadelphia Inquirer – April 2, 2000: In the waning months of John Bucci’s life, he pulled John Jr. aside for a serious talk. “Whatever you do,” he told his son, “I don’t care how drunk you are, I don’t care how in love you are, never give this recipe away. This is my family’s name. This is what’s important to me.” Bucci, of course, who died of cancer nine years ago today, was speaking of his recipe for roast pork. Do your kids know where their food comes from? If the answer is “the grocery store”, think again. I recently made up a game with the kids where one person named a food and the rest had to determine how it was made or grown. To my disappointment, they actually did not realize that Rice Krispies were, at one time, actually rice. Although we were all a bit stumped when Mac asked “how do they make Soy Milk from edamame?”. I’ll have to get back to you on that one…. Sunday Gravy: Don’t be intimidated when italians tell you they make their gravy themselves, you can too. Now, this recipe doesn’t start with fresh tomatoes because frankly, we just don’t have time. However, I guarantee you will enjoy it! Get a big sturdy pot (I use my grandmother’s and if it could talk….) and heat up some fresh garlic in some olive oil (don’t brown it). Chop 1/2 an ONION very well and grate a CARROT (for sweetness) into the pot and add a drop more olive oil. If you want: I like to add a drop of tomato paste that I keep in a tube in the fridge, I hate to waste a can just for a tablespoon or so. Cook mixture for about ten minutes or until it is soft. Add two cans of CRUSHED TOMATOES (I like San Mazano or Tuttarosa). You can use peeled tomatoes and crush them in your hands too. Add salt, pepper and basil to taste (a sprinkle of crushed red pepper will not be too hot but adds flavor too). If you have a BAY LEAF, drop it in but don’t eat it! Bring to boil and then reduce heat and cook it on LOW for 30 minutes or 6 hours! Note: My grandmother made her gravy with tomato paste and water instead of canned tomatoes but it took a lot longer to cook. PORK CHOPS/SAUSAGE: I didn’t have any ground turkey or beef for meatballs, but I found some pork chops in the freezer. Defrost the pork chops (or sausage) partly in the microwave, then if you leave them on your granite counter on Saran wrap, they will defrost the rest of the way very quickly. Variation: try taking the sausage out of the casing and frying it like taco meat. Then, pour into gravy – fabulous! My favorite is CAVATELLI or in my family, “GUV-A-DEEL”. Although my grandmother would call any/all types of pasta , “macaroni”! I flipped to a cooking show in italian today and watched as the chef put literally a FIST full of salt in his pasta water prior to boiling. I may not have understood what he was saying, but I got the picture – load up on the salt in the water, it does actually make the water boil more quickly! Veggies: Make a salad or serve some baby carrots on the side. Americans were the first to serve spaghetti WITH meatballs. 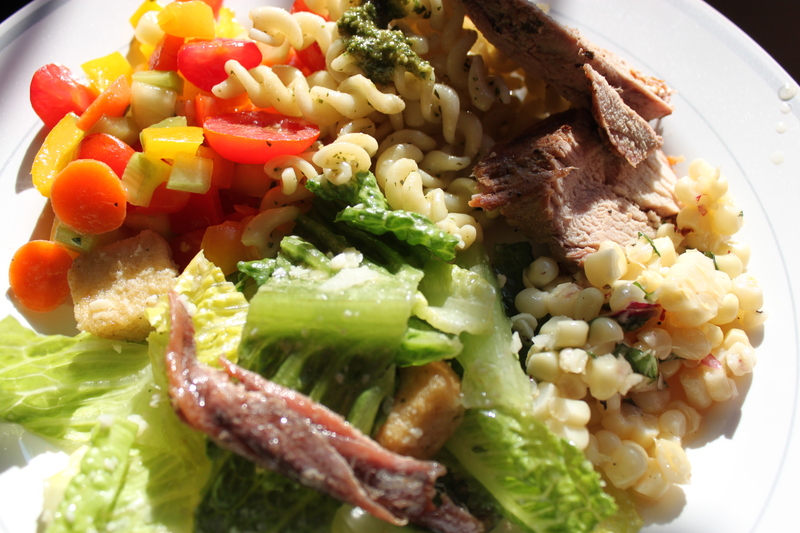 Italians always served their meat and pasta separately. The rich in the 1500’s believed tomatoes were poisonous. Their fancy plates/utensils were made of pewter and foods high in acid content (tomatoes) would cause the lead to leach out into the food causing lead poisoning and death. The poor ate off wood plates so they had no aversion to tomatoes whatsoever.